Aquisition History: This property was acquired through the efforts of the Great Bay Resource Protection Partnership (www.greatbaypartnership.org) and transferred to the NH Fish & Game Department in 2006. Description: The Piscassic River WMA lies mostly south of the Piscassic River, west of the Piscassic Ice Pond, and east of the New England Dragway. The WMA is relatively flat (elevations typically don’t exceed 100 feet) and contains extensive wetland systems, both forested and emergent. 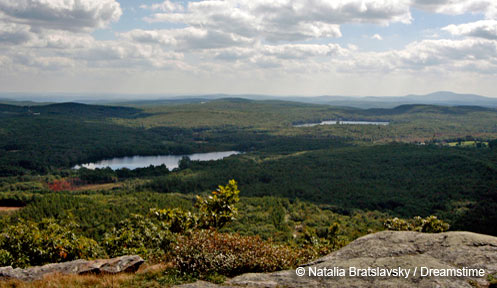 The NH Natural Heritage Bureau has officially recognized the exemplary condition of these important habitats given that wetlands of this size and condition are uncommon in New Hampshire. Forested wetland areas are typically comprised of either hemlock or red maple. Dryer uplands are dominated by white pine, oak, and red maple with some scattered hickory and pitch pine. A complex of three old fields, totaling 16 acres, is located in the northeast sector of the property and consists of grasses/forbs, high bush blueberry, and other shrubs, with birch and aspen dominating the edges. Common Wildlife: Common wildlife species include white-tailed deer, black bear, turkey, woodcock, and snowshoe hare. Veery, wood thrush, Eastern towhee, whip-poor-will, and a variety of other songbirds will delight bird watchers. Other species that may be found on the property include spotted salamanders, wood, and spotted turtles. Directions: Piscassic River WMA is located in the towns of Exeter, Newfields, and Epping and can be accessed from Beech Hill Road off of Rte 101 in Exeter or via Cuba (aka Cubie) Rd off of Rte 87 in Newfields. Unimproved parking for 1-2 vehicles is provided near the gates at both access points.